After almost 18 months of my laptop being set up in the playroom, I am over it. Over. I am sick of the kids playing with my mouse, sick of fingerprints everywhere and definitely sick of my paperwork being used as art material. The problem is that we have 3 bedrooms, a playroom, and an un-winterized sunroom. There is nowhere for me to go. My kids already share a bedroom, my husband has an office, we have a bedroom, and there's a downstairs playroom off the living space. What about me? Our bedroom is a good size and honestly, all we use it for is sleeping, so it seems to be the best place. There's enough room for a desk and a bookshelf - all I need. Apart from inspiration. 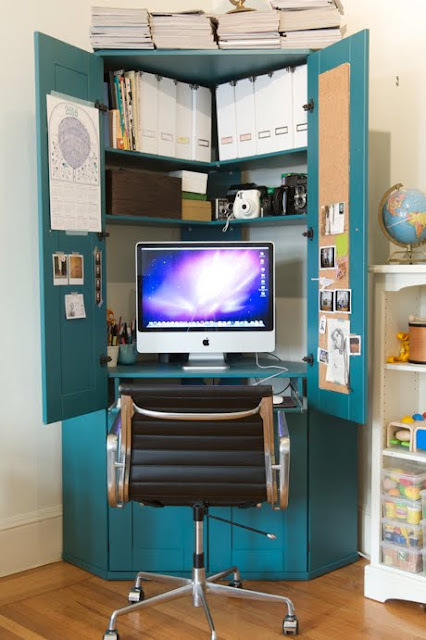 I am loving Jordan's idea above for an office in an armoire. I just don't know if I can bothered to put a sliding part into an armoire, plus I have a laptop, so I need to be able to tuck my knees in! Although it's not my style, I love this idea of two bookshelves with one on castors. What a great idea! This is a great example of using space to the max. This would work well in our bedroom. I had thought of using our linen closet as an office (it happily has a light in it), but had decided it wasn't a good idea. But looking at this makes it seem possible with a coat of fresh paint and a desktop. It already has great shelves in a U shape. Stay tuned.